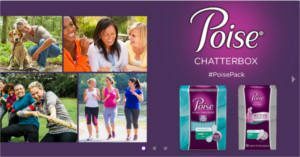 Apply to be a Chatterbox for Poise. 500 Chat Packs are available. 1 sample pack of NEW Poise Active Collection Pads or Liners OR 1 sample pack of Poise® Ultra Thin Pads. Apply now and if selected, we’ll deliver a Chat Pack right to your doorstep.